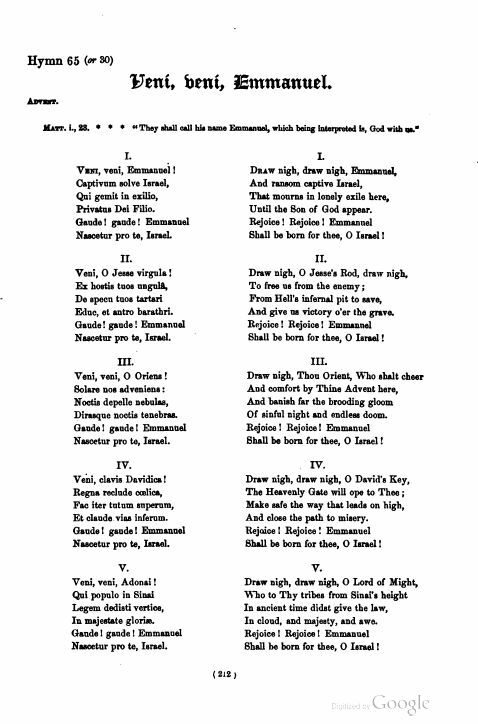 Also published as "Oh, Come, Oh, Come, Emmanuel"
in Mediaeval Hymns and Sequences, 1851. 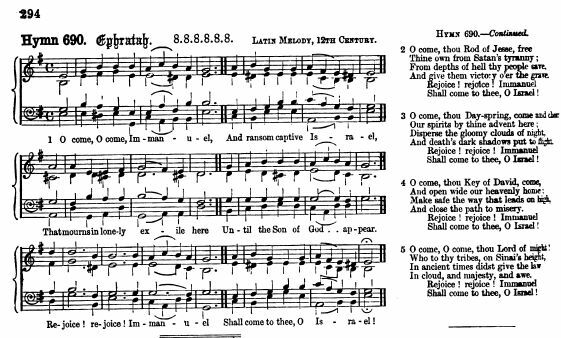 Neale's original translation began, "Draw nigh, draw nigh, Emmanuel." 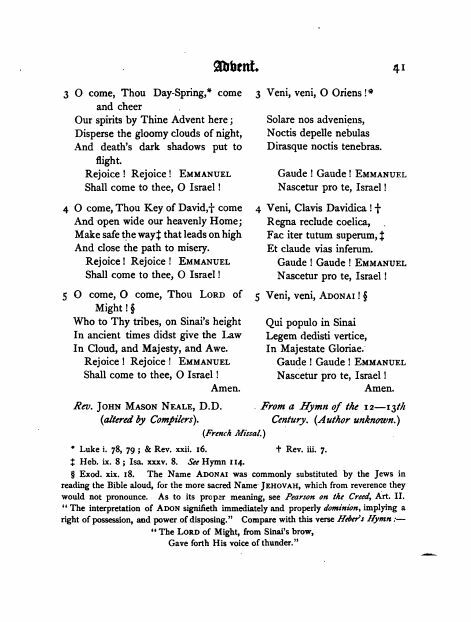 Neale only translated 5 of the 7 Antiphons (See Notes, below). This version by John Mason Neale, "Altered by Compilers. Source: Hymns. 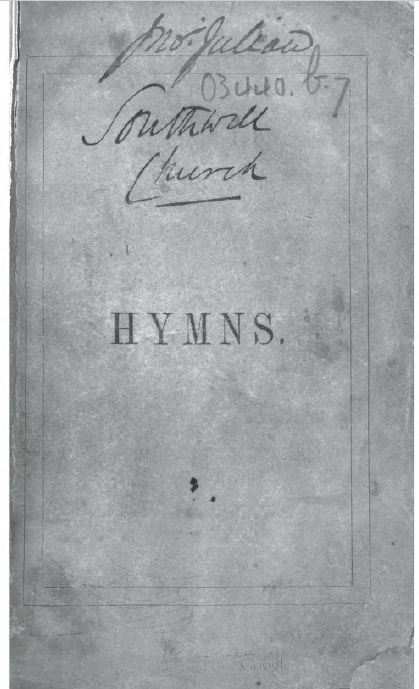 (Printed for temporary use, and as a specimen of the Hymn Book Hymns Ancient and Modern now in course of preparation. ), 1859. 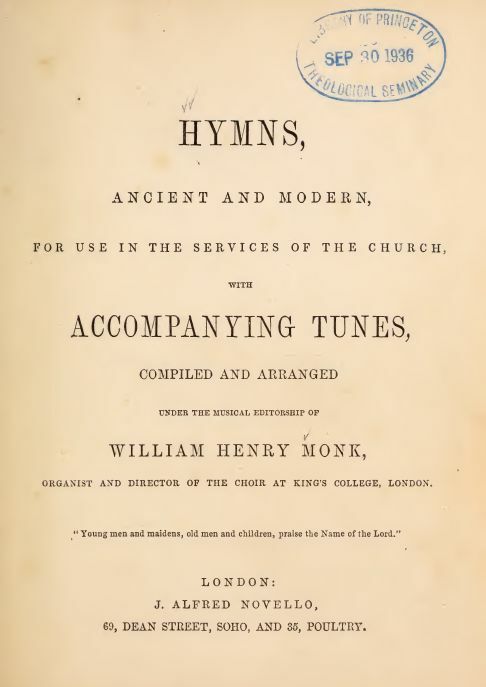 Also found in William Henry Monk, ed., Hymns, Ancient and Modern With Accompanying Tunes (London: Novello and Co., 1861), #36. "The Redeemer shall come to Zion"
1. O come! O come! Emmanuel! 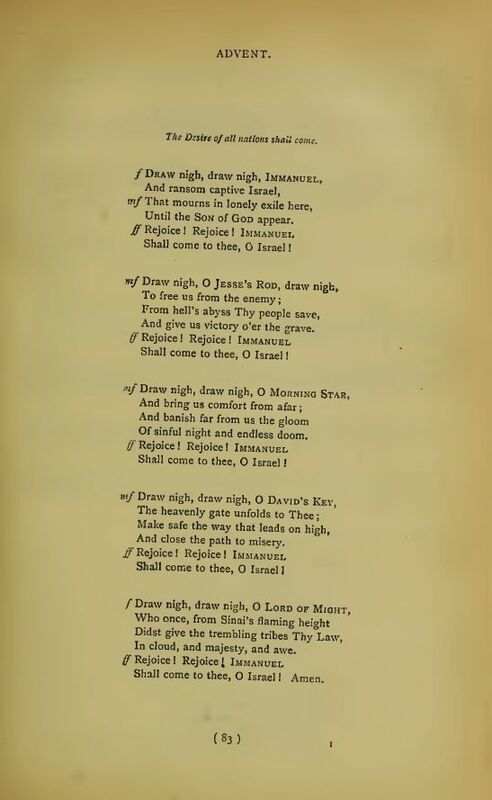 Shall be born for thee, O Israel! Amen. To thee shall come Emmanuel." And teach [cause] us in her ways to go. And cause us in her ways to go. Refrain. Fill the whole world with heaven’s peace. Refrain. These verses occurred in Henry Sloane Coffin and Ambrose White Vernon, eds., Hymns of the Kingdom of God. 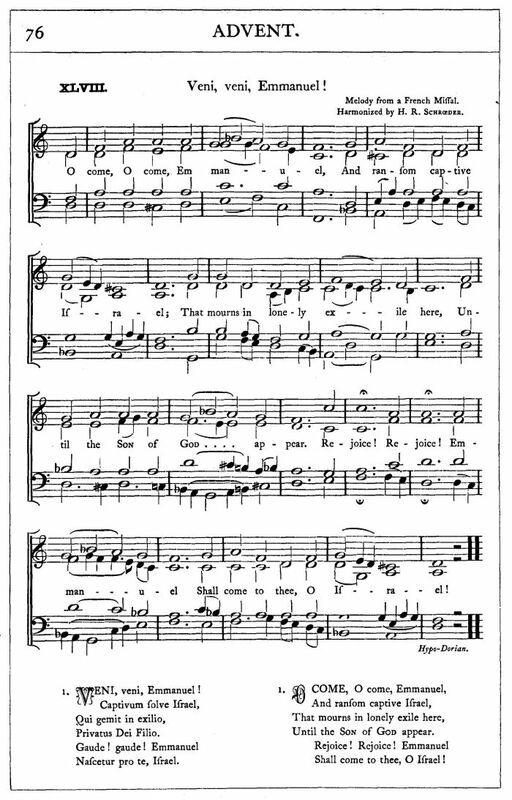 Revised (New York: The A.S. Barnes Company, 1916), Hymn #37. Verse one was the translation by Rev. John Mason Neale. For more information about Henry Sloane Coffin, see Pastor, educator, ecumenist: Henry Sloan Coffin (1877-1954), a "Presbyterian Heritage" article by James H. Smylie, June 6/13, 2005, at The Presbyterian Outlook. Coffin's noted work Some Christian Convictions: A Practical Restatement in Terms of Present-Day Thinking is reproduced at Project Gutenberg. Links open in new windows at exterior sites. 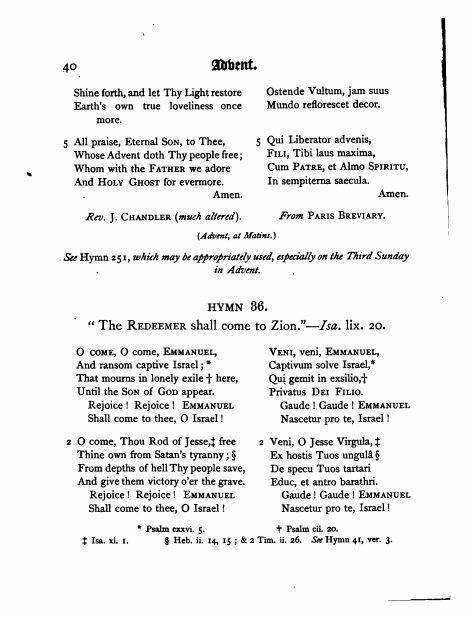 English & Latin Text from Louis Coucier Biggs, ed., Hymns Ancient and Modern (London: Novello & Co., 1867), #36, pp. 40-41. 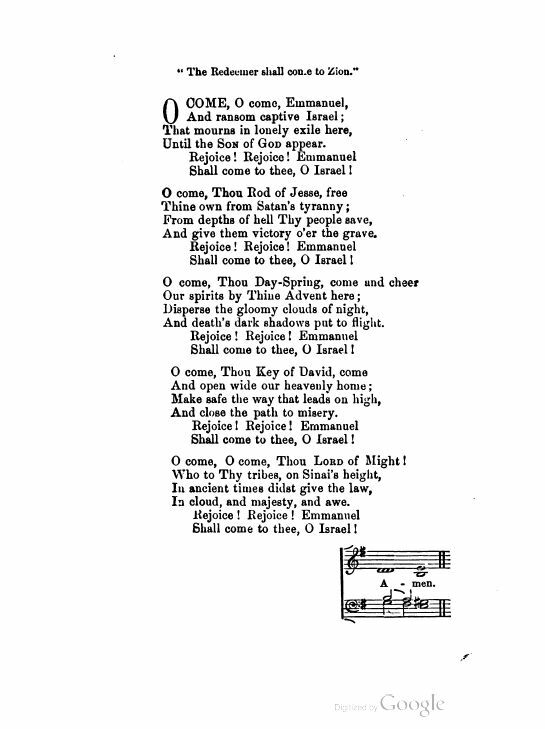 Sheet Music to "Ephretah" to "O come! O come! Emmanuel!" 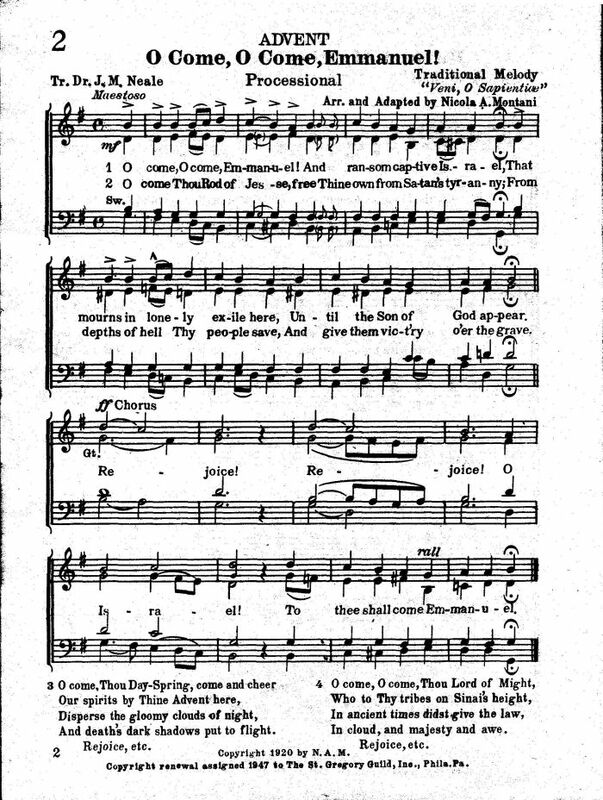 from A Collection of Hymns, For the Use of the People called Methodists. With a new Supplement. 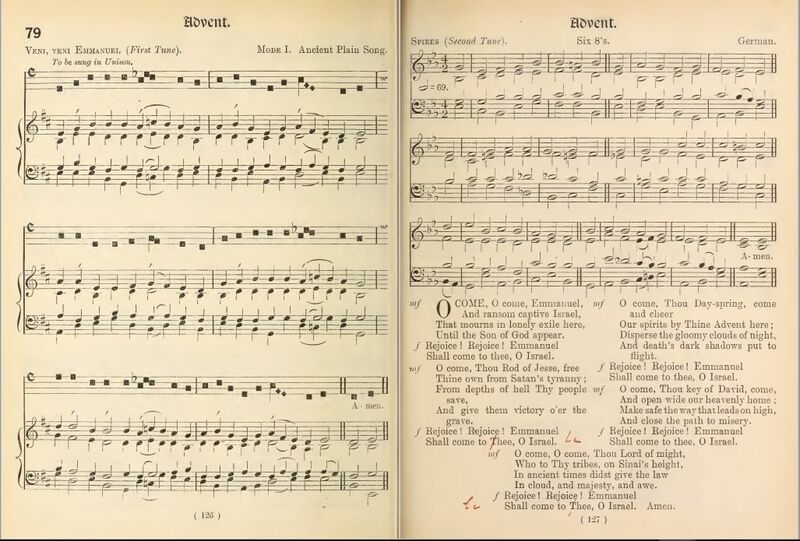 Edition With Tunes (London: Wesleyan Conference Office, 1877), "Ephretah," #690 (First Tune), p. 294. 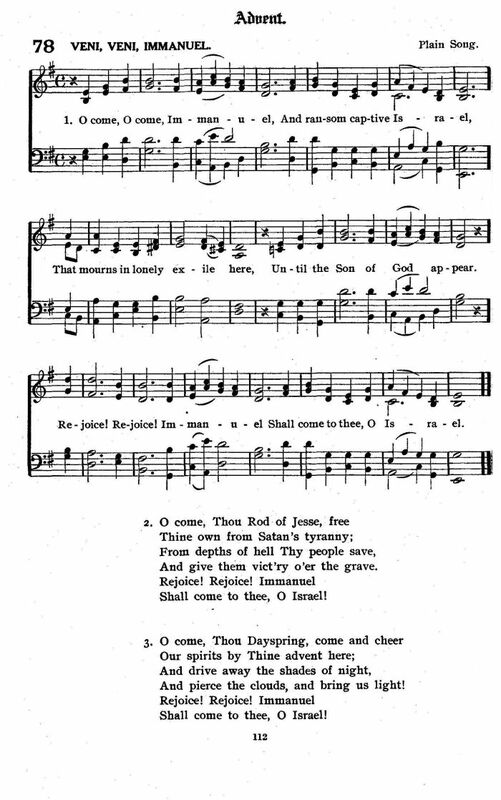 Sheet Music to "Emmanuel" to "O come! O come! Emmanuel!" 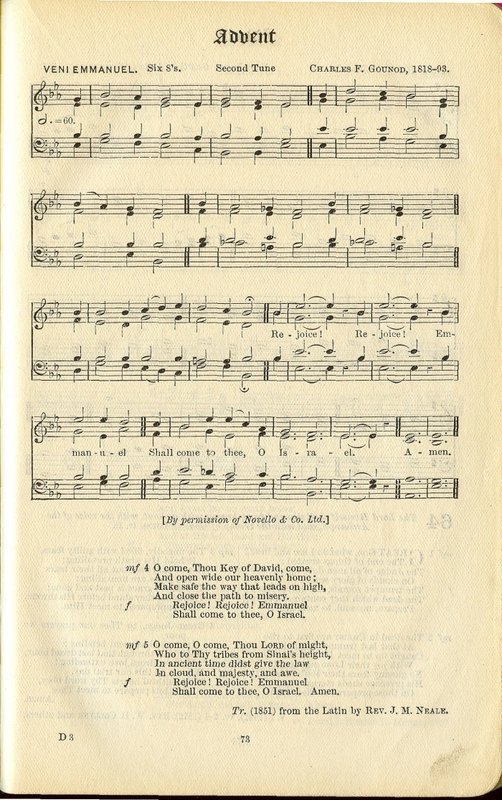 from A Collection of Hymns, For the Use of the People called Methodists. With a new Supplement. 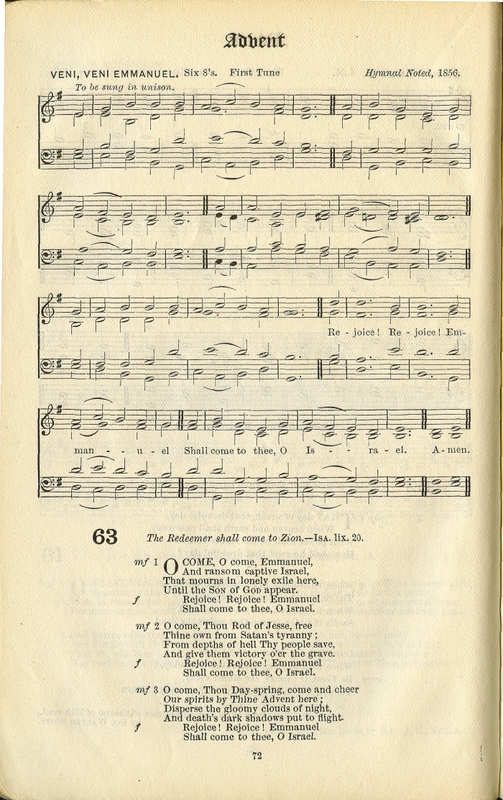 Edition With Tunes (London: Wesleyan Conference Office, 1877), "Emmanuel," #690 (First Tune), p. 294. 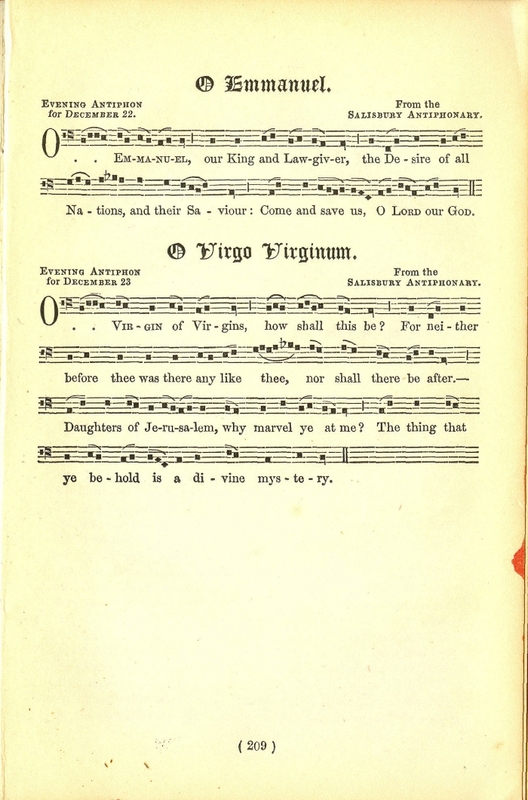 Sheet Music to "Veni, Veni Emmanuel," Melody from a French Missal Harmonized by H. R. Schrœder from J. H. Hopkins, ed., Great Hymns of the Church Compiled by the Late Right Reverend John Freeman Young. New York: James Pott & Company, 1887, #48, pp. 76-7. "Melody from a French Missal. Harmonized by H. R. Schrœder." 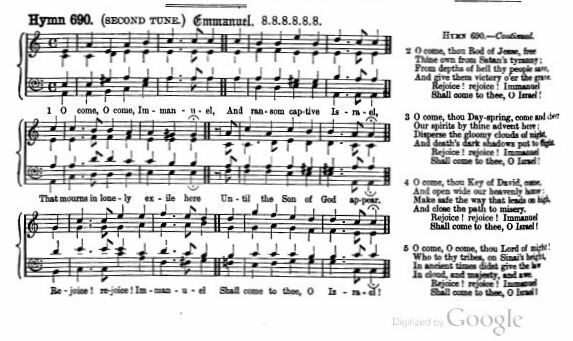 John Mason Neale and Thomas Helmore, eds., Hymnal Noted - Part II. London: Novello, 1854, 1856. 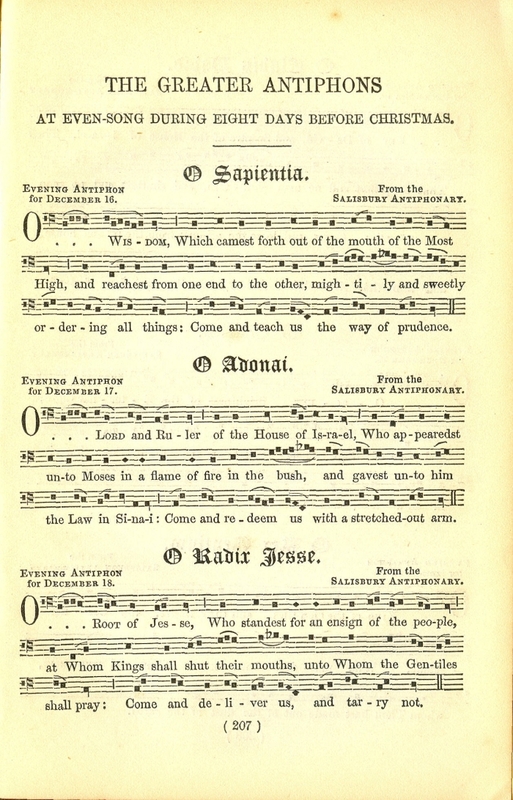 The Greater Antiphons, pp. 207-209. 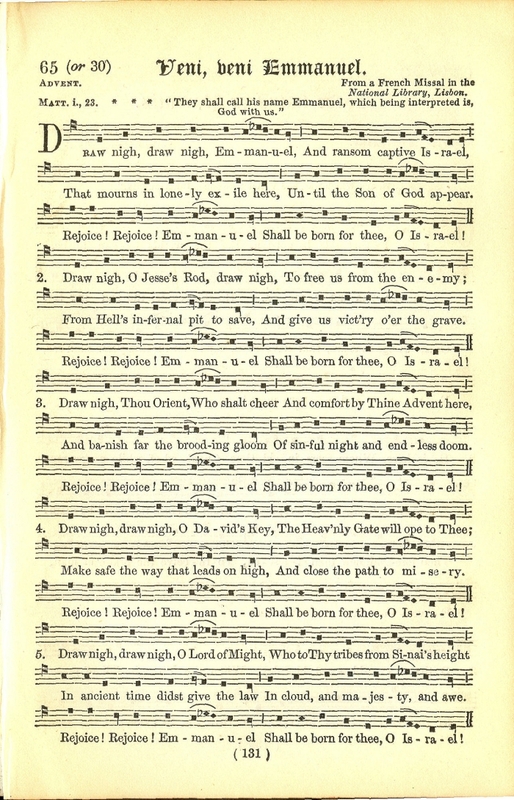 Sheet Music from Thomas Helmore, Accompanying Harmonies To The Hymnal Noted (London: Novello, Ewer and Co., 1858), pp. 212-213. 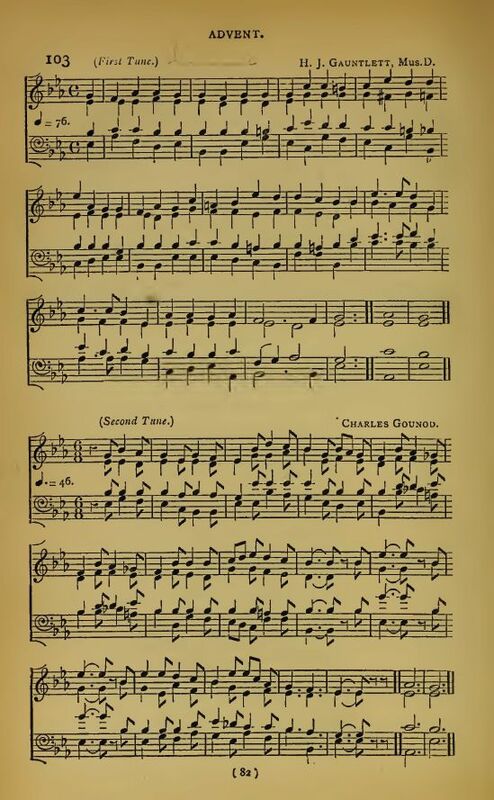 Sheet Music To "Veni, Veni Emmanuel" (the Hymnal Noted, 1856) and "Veni Emmanuel" by Charles F. Gounod from George C. Martin, The Book of Common Praise. Oxford: Oxford University Press, 1909, #63. 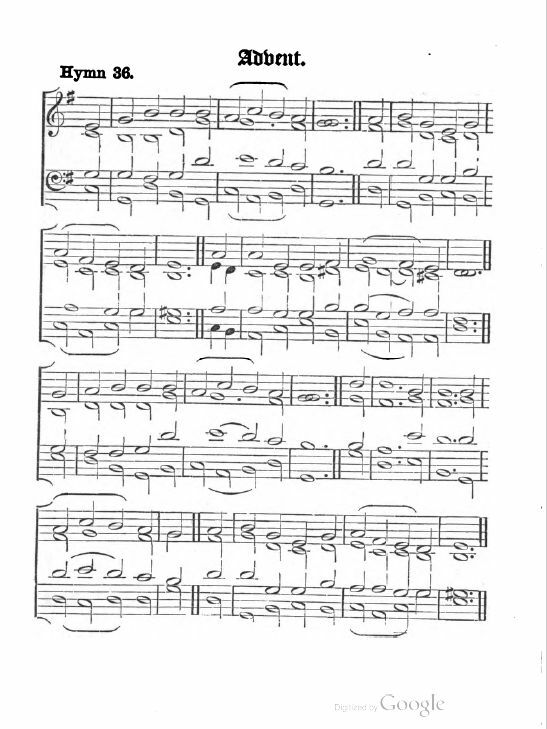 Sheet Music: "Veni, O Sapientiæ" adapted and arranged by Nicola A. Montani from Nicola A. Montani, ed., The St. Gregory Hymnal And Catholic Choir Book. Philadelphia: St. Gregory Guild, 1920, #2. 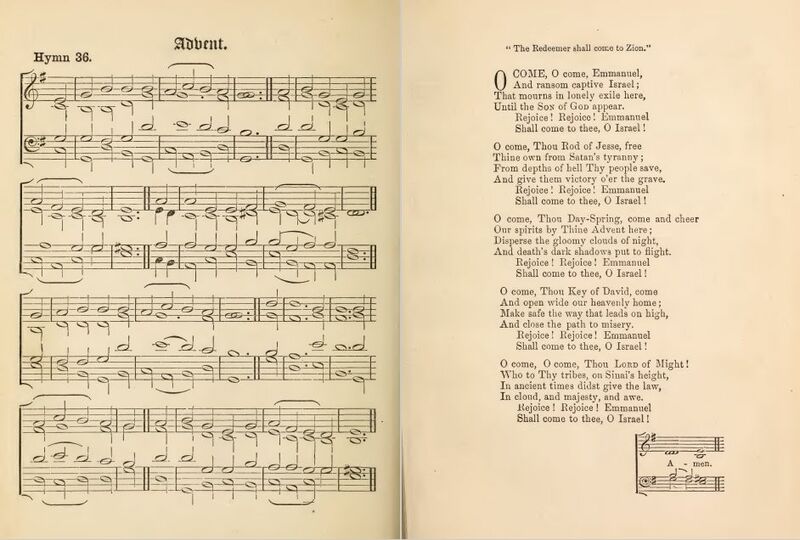 Sheet Music to "Veni Emmanuel" by Charles F. Gounod (1818-1893, 1872) from the Hymnal and Liturgies of the Moravian Church. Bethlehem, PA: Provincial Synod, 1920, #106. 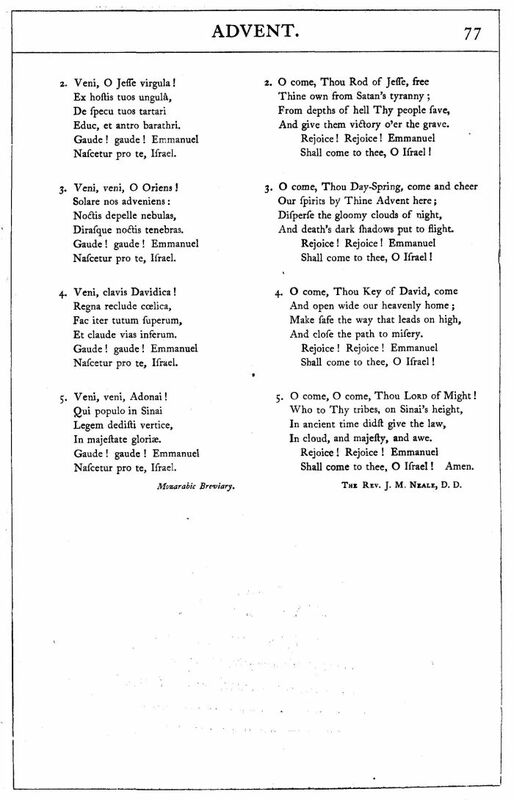 Sheet Music to "Ephratah" by H. J. Gauntlett and to "Veni Emmanuel" by Charles Gounod to "Draw Nigh, Draw Nigh Immanuel" from William Cooke and Benjamin Webb, eds., The Hymnary-A Book Of Church Song (London: Novello, Ewer and Co., 1872), #103, pp. 82-83. 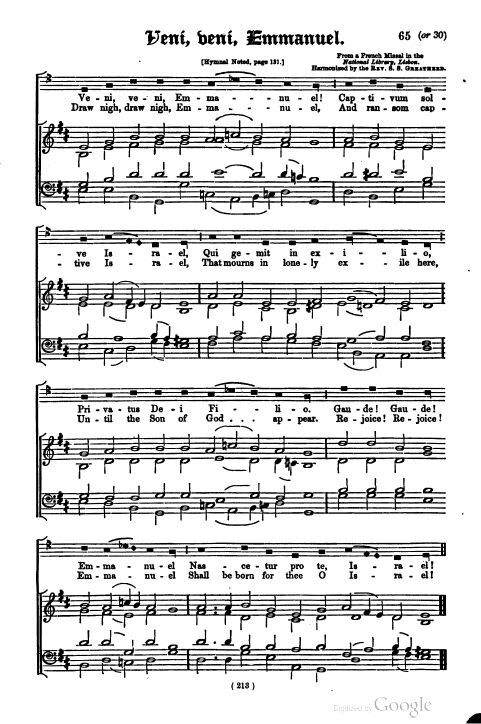 Sheet Music "Veni, Veni, Emmanuel" and "Spires" (German) in Charles H. Lloyd, ed., Church Hymns With Tunes. New Edition. 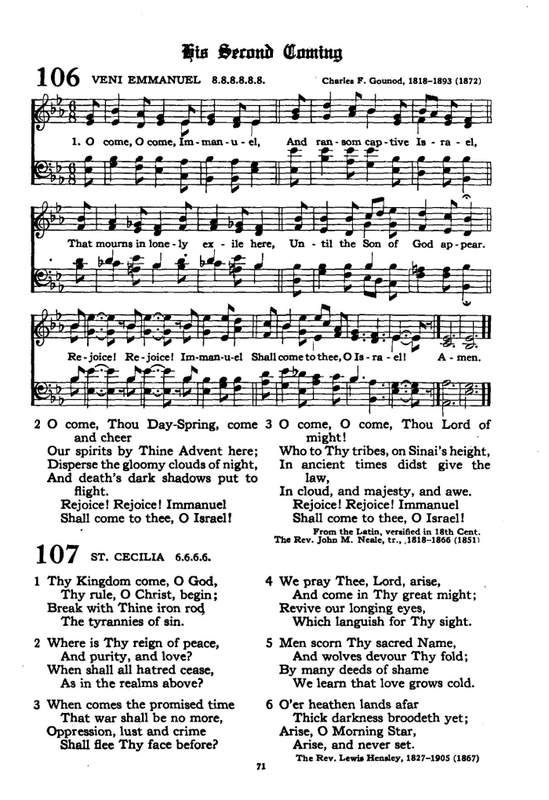 (London: Society for Promoting Christian Knowledge, 1903), Hymn 79, pp. 126-127. 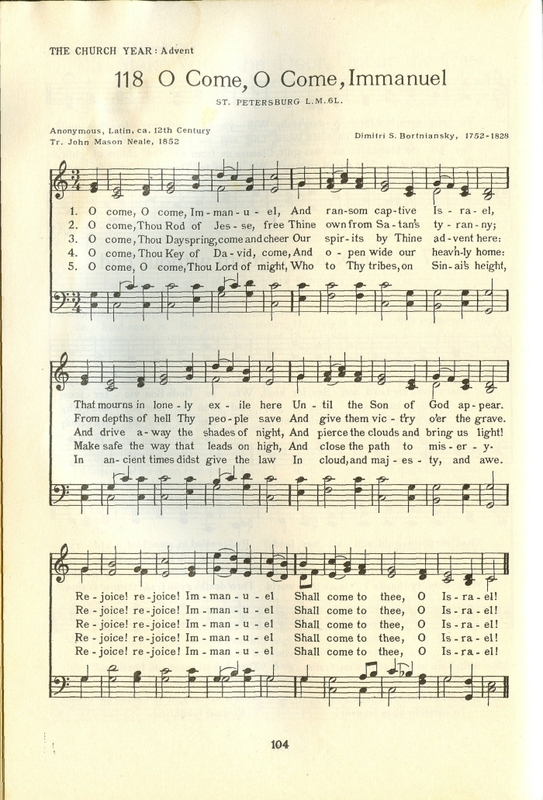 Sheet Music from Hymns, Ancient & Modern (London: William Clowes and Sons, Limited, 1904), Hymn 47, pp. 66-67. Changes are to verse 3, lines 1 and 2, and verse 5, verse 1.
and shall call his name Emmanuel." 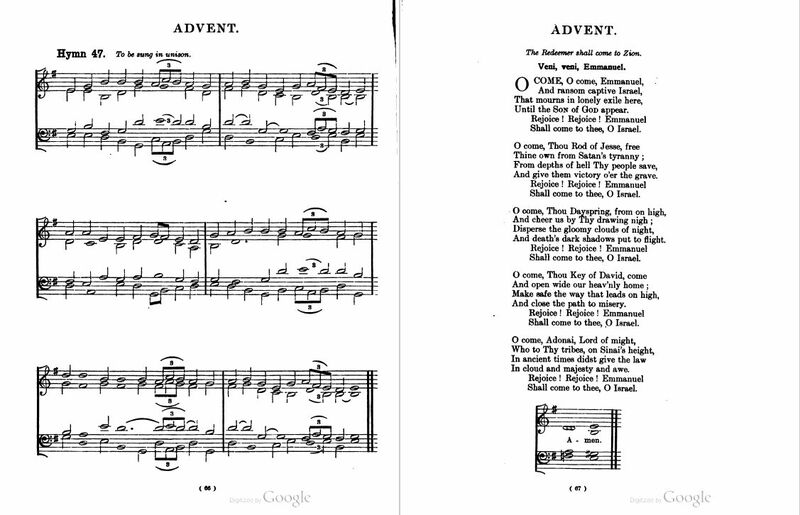 This Advent hymn, originally written in 1851 as "Draw Nigh, Draw Nigh, Emmanuel" by the Rev. 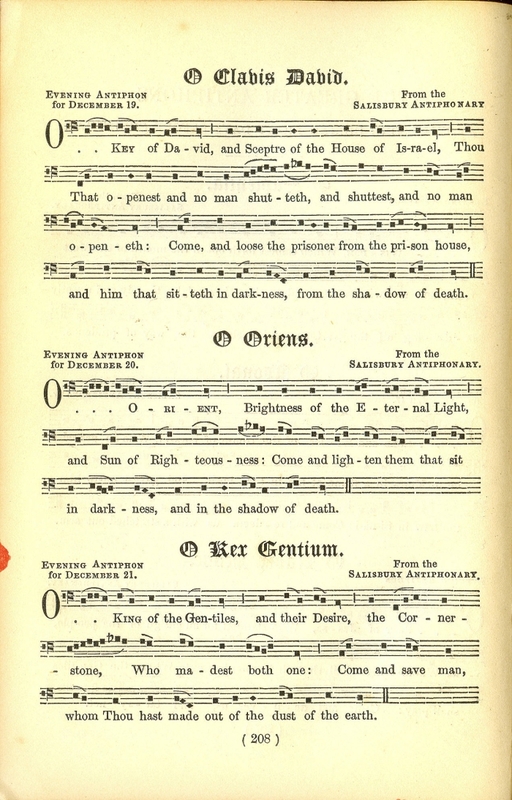 John Mason Neale (1818-66), was based on one of the oldest of Christian prayers — referred to as the "O" Antiphons, the "Greater" Antiphons, and "The Seven O’s." The full text of these, with notes, can be seen at: The Great O Antiphons, which also includes some possible scriptural underpinnings. For more, please see Notes on Veni, Veni, Emmanuel.